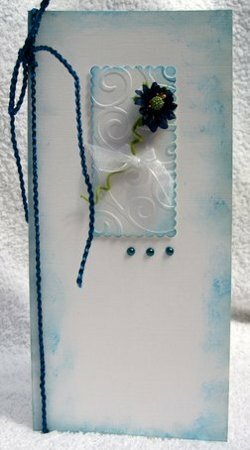 I agree that sometimes simple Elegant Cards can be the better idea ... but only sometimes ! 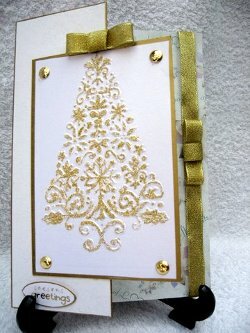 I am a "Bling" girl and I openly admit that "More Is More" for my style of cardmaking. 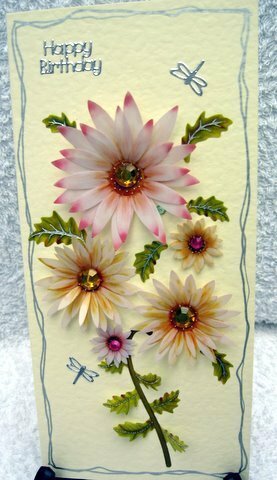 This card would be equally as good used as a birthday, thank you, or invitation card. The elegance comes from using good quality card and leaving lots of white space around the image. And of course just a little "Bling"
And it goes without saying that by "good quality" I don't mean expensive. There is a lot of Card around with good weight that will fit the bill perfectly. Maybe you can't afford the real Flowers on Valentines day, but these little paper beauties wouldn't break the bank. 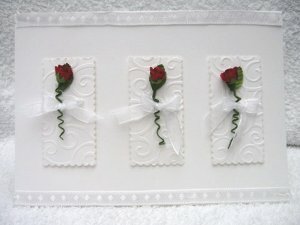 This card is very simply a white square with an embossed flower detail on the panel mounted onto silver mirror card. The butterflies and sentiment are also in silver and keep it all to the same theme.